​On this page, IRSN publishes information notes on the health impacts of the Fukushima Daiichi accident on the inhabitants of the region, as well as on the monitoring of personnel working at the nuclear power plant. 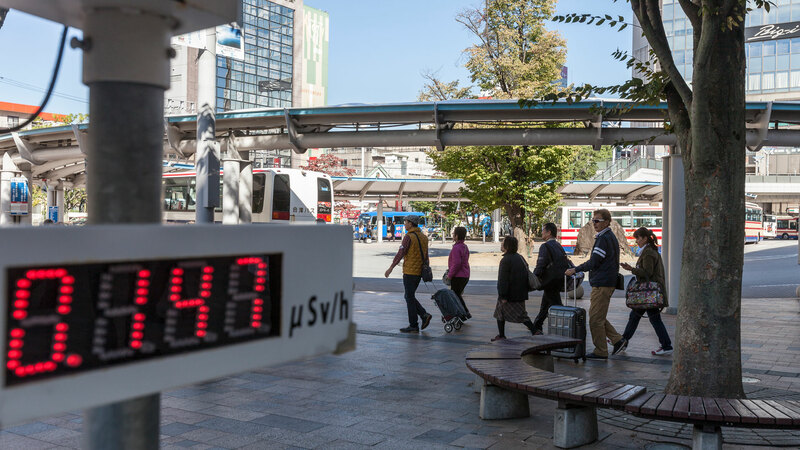 ​Starting at the end of June 2011, the Japanese health authorities put in place four epidemiological studies in order to assess the health of persons who had been exposed to radioactive releases and to monitor them over time. Planned for a period of approximately 30 years, the management of these studies was entrusted to the Fukushima Medical University (FMU) in collaboration with other Japanese medical centres. According to the latest assessment conducted on 31 December 2015, 564 083 people of the 2 055 326 inhabitants of the Fukushima prefecture had answered the questionnaire, i.e. a response rate of 27.4%. Of the 459 620 residents of the Fukushima Prefecture not employed at the power plant and for whom an external dose was estimated, 285 418 people (or 62.1% of those assessed) received, over the course of the first four months following the accident, external doses of less than 1 mSv and 15 people (0.003% of those assessed) received doses greater than 15 mSv. No significant evolution in these statistics has been observed over time. In order to assess the thyroid function of children exposed to radioactive releases, the Fukushima Medical University started a large-scale campaign in April 2011, comprising ultrasound examinations of the thyroid gland, aimed at approximately 360 000 children present in the Fukushima prefecture at the time of the accident. Of the 300 476 children included in the first screening campaign, the annual incidence of thyroid cancer in children under 18 is 11 out of 100,000. According to initial analyses, the annual incidence of thyroid cancers is 15 times greater in children from the Fukushima Prefecture than in those from the rest of Japan (data from the period 2003-2007 in the thyroid cancer registries of eight other Japanese prefectures not concerned by fallout from the Fukushima). However, the annual incidence of thyroid cancers in children, estimated on the basis of a systematic screening campaign, cannot be compared to that estimated on the basis of data recorded without such a campaign. Thus, during the period 2011-2014, four systematic screening campaigns for thyroid cancer were carried out in children under 18 years of age in prefectures not affected by the Fukushima accident. The data from these studies shows that the annual incidence estimated on the basis of systematic screening of thyroid cancer in children is between 23 and 130 out of 100 000. In conclusion, this data shows that there is no significant difference between the annual incidence observed in the Fukushima prefecture and that estimated on the basis of a systematic screening programme in prefectures that were unaffected by the fallout from the Fukushima accident. According to the provisional data from 236 595 children who, at 31 December 2015, had attended a thyroid check-up, the annual incidence of thyroid cancer in children under 18 is between 4 and 14 out of 100 000. It is impossible to determine at present whether or not an increase will be observed in thyroid cancer in children from the Fukushima Prefecture. The screening campaigns must be continued to obtain a trend from which well-founded conclusions can be drawn. In other words, a connection with the Fukushima accident may only be made if the annual incidence of thyroid cancer in children increases starting from the period 2016-2018. The 210 000 or so people who were evacuated in the weeks following the accident are required to come in for an in-depth medical check-up once a year. The latest report dated 31 December 2015 shows that fewer and fewer people are showing up for the medical check-up as the time since the accident increases. The observations drawn from the health check-ups carried out also show an overall improvement in evacuees' physical state of health, most likely related to a gradual improvement in living conditions, which had fallen in the first months following the accident. With regard to the assessment of the psychological consequences of the accident, 4 386 people (473 children and 3 913 adults) benefited from telephone support. For the children, the problems were mainly: excessive emotions, irritability, relationship problems with their friends, and rebellious behaviour (31.4%). For the adults, depression was the main problem raised during the telephone interviews. This study focusses on the monitoring of around 20 000 women in the Fukushima prefecture who had notified their pregnancy from 1st August 2010 onwards, and on the monitoring of possible genetic and congenital anomalies in their children. there was no significant evolution in the miscarriage rate;the premature birth rate, after having increased between 2011 and 2012, dropped in 2013. It is not significantly different from the rate observed in Japan generally;congenital malformation rates at birth have decreased very slightly since August 2010. They are comparable to the Japanese national average, which is between 3 and 5%. Over the 2013/2014 period, 1 101 women expressed their wish for psychological support by telephone or during a medical consultation. The reason mentioned was related to depressive symptoms in 67.6% of cases and, for 17.1%, to the fear of the impact of radioactivity on their pregnancies. These percentages were lower compared to those observed for the periods 2011/2012 and 2012/2013. The main information available concerning the workers at the Fukushima Daiichi power plant is that provided by TEPCO, the facilities management company. 22.44 mSv for TEPCO staff, i.e. a slight decrease of 0.67 mSv compared to the results published in February 2015;11.61 mSv for subcontractor staff, i.e. an increase of 0.76 mSv compared to the results published in February 2015. The maximum recorded dose is 678.80 mSv for a TEPCO worker; six workers have, since the accident, received a total dose exceeding the 250 mSv limit set by decree at the height of the accident. Moreover, the total number of workers having received a dose exceeding 100 mSv (maximum exposure limit in an emergency situation) has not evolved since April 2012 (150 TEPCO workers and 24 subcontractors). To date, at least ten workers' deaths have been recorded, none of which are attributable to exposure to ionising radiation according to information from the Japanese authorities. It must be noted that few studies concern the exposure of workers involved in the handling of the disaster but who did not intervene at the Fukushima power plant (firemen, policemen, municipal employees, self-defence force personnel). The UN Scientific Committee on the Effects of Atomic Radiation (UNSCEAR) published a report on this topic in 2014, but the information is very disseminated and lacks clarity. Moreover, a study published in 2014 presents the results of the monitoring carried out on 101 Minamisoma general hospital employees (located 25 km north of the power plant). In October 2015, a former TEPCO employee was awarded financial compensation. According to a 1976 government law, any worker exposed to an annual dose equal or superior to 5 mSv and who develops leukaemia during the first year following their posting to work that is likely to expose them to ionising radioactivity, must receive financial compensation for damages suffered. According to the Japanese health ministry, eight workers from the Fukushima power plant have, since 2011, requested compensation, eliciting pathologies that they confirmed were due to exposure to ionising radiation. Of these eight requests, three were rejected and one was eventually withdrawn by the worker. The other requests are apparently still pending. 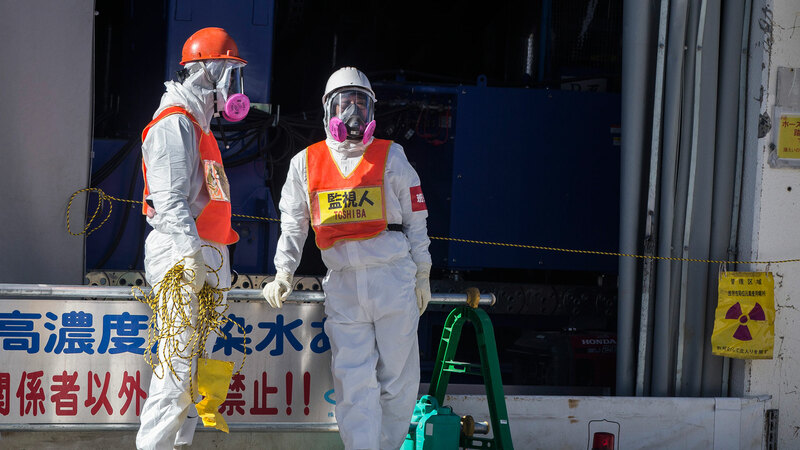 Each worker, including those no longer involved in current operations at the Fukushima Daiichi power plant, benefits from a basic medical check-up. To our knowledge, no precise and comprehensive assessment of this health monitoring has been published to date, either by the Japanese authorities or by TEPCO or its subcontracting companies. In 2015, the International Atomic Energy Agency indicated that TEPCO had carried out thyroid ultrasound examinations. The results showed that there was no significant difference between the 672 workers having received an equivalent dose to the thyroid exceeding 100 mSv in 2011, and the other 1 437 workers having received lower doses. In its report published in 2014, UNSCEAR confirmed that no acute irradiation syndrome had been observed, nor was it expected, taking into account that the doses received by the most exposed workers had always remained below the occurrence thresholds of these effects. The increased risk of cancer for the 174 workers having received over 100 mSv is low. Between two and three additional cancer cases could arise in addition to around 70 cancers expected in the absence of exposure. Among these individuals, one case of leukaemia could be caused by exposure. It is very unlikely that a potential increase in the incidence of radiation-induced cancer is detectable in the 2 000 or so workers who received a dose to the thyroid of over 100 mGy. However, the observation of cases of hypothyroidism (reduction in thyroid function) cannot be excluded.For workers having received the highest effective doses, the probability of an excess of circulatory diseases exists - at least in theory according to current scientific knowledge - yet remains low.On a statistical level, the data is insufficient to be able to reach a decision regarding a potential increase in the incidence of cataracts.There are risk of post-traumatic stress disorders (PTSD). A survey carried out two to three months following the accident reveals the appearance of such disorders in some workers.